I’m a huge donut fan. If I can find a way to include them in my everyday, you know I’m going to take it. So it was only a matter of time before I found a way to incorporate donuts with cake! 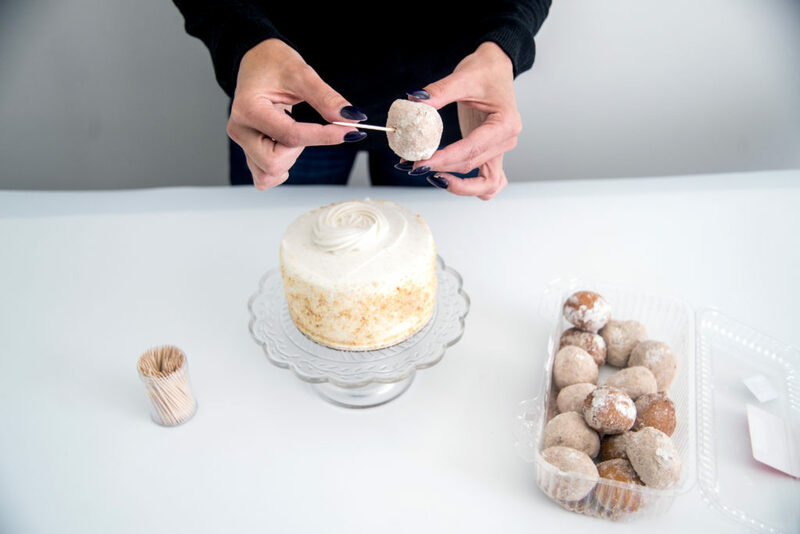 This easy donut hole cake hack not only saves you time, stress, and a messy kitchen, but it looks and tastes great too! (If you can’t find a plain cake that’s already available in the bakery section at your local grocery store, talk to the employees behind the bakery counter. They can usually whip one up for you without much notice). Firmly press the toothpick donut into the side of your cake along the bottom. Continue repeating the process, along the side and bottom of the cake. 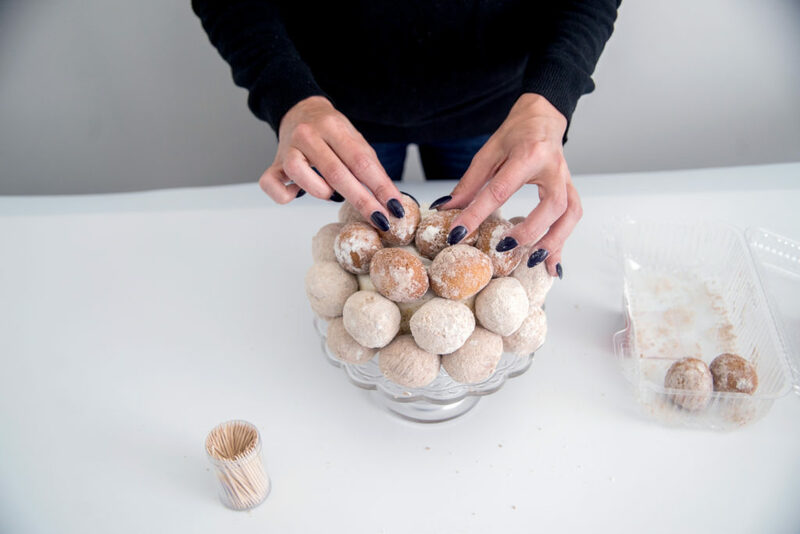 Get the donut holes as close to each other as possible to prevent being able to see the cake through the gaps. 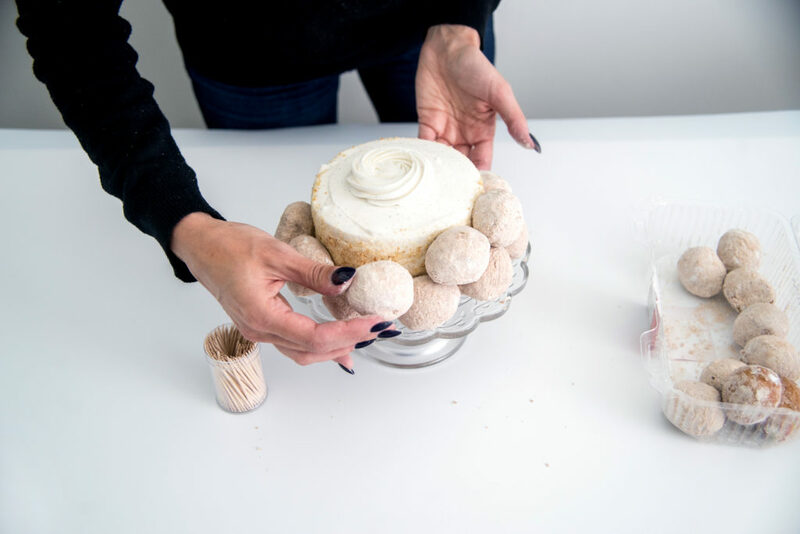 Once you have the entire section along the bottom of the cake covered, begin adding another line of donut holes, on top of the previous one, working each of the donuts into the gaps above the first layer. 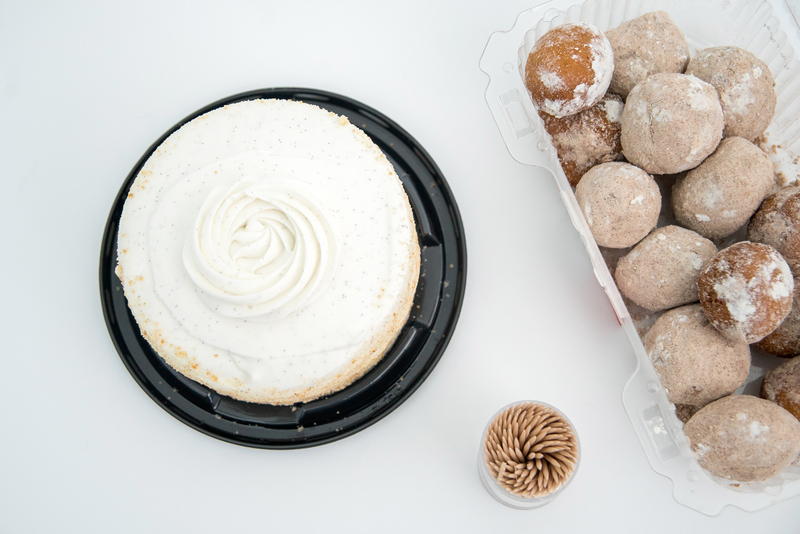 Repeat this step until the entire side of your cake is covered with donut holes. 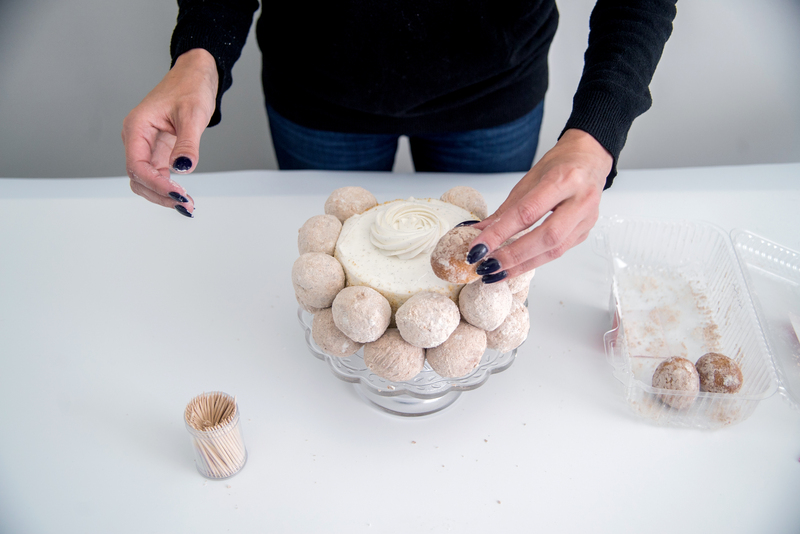 Next, begin adding donut holes to the top of your cake, starting along the top edge. Make sure to fill in any gaps that show between the first top layer and the side layer. 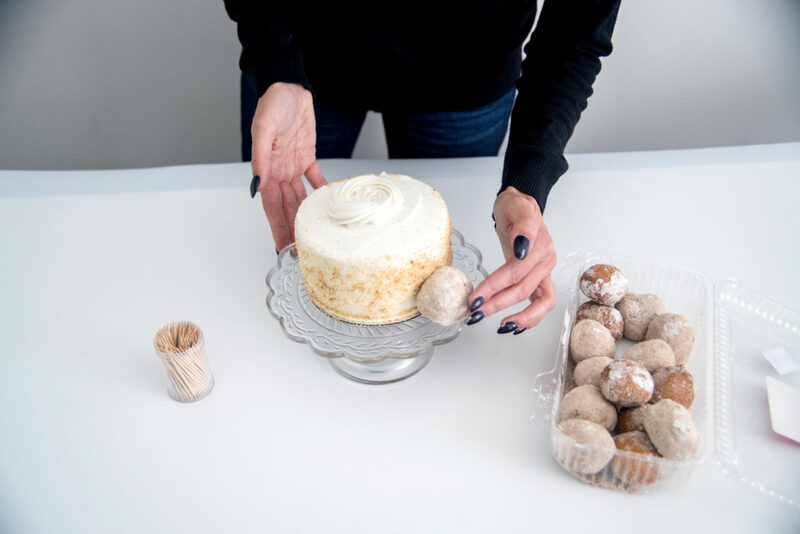 Continue adding donut holes, working your way in towards the top center of your cake, until the entire top of the cake is covered. 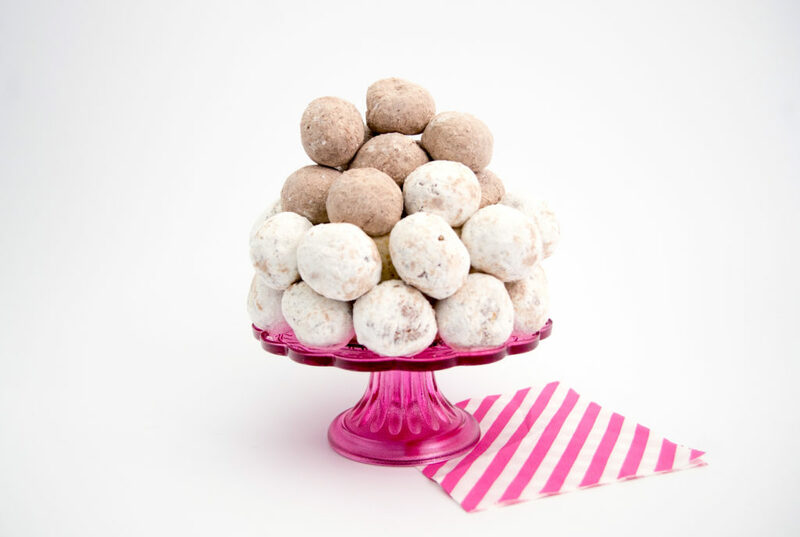 Add a few more donut holes to the top of the cake, creating a smaller peak of donut holes on the top. This final layer will add a little bit of dimension to the finished cake! Step back and enjoy your donut hole cake masterpiece! 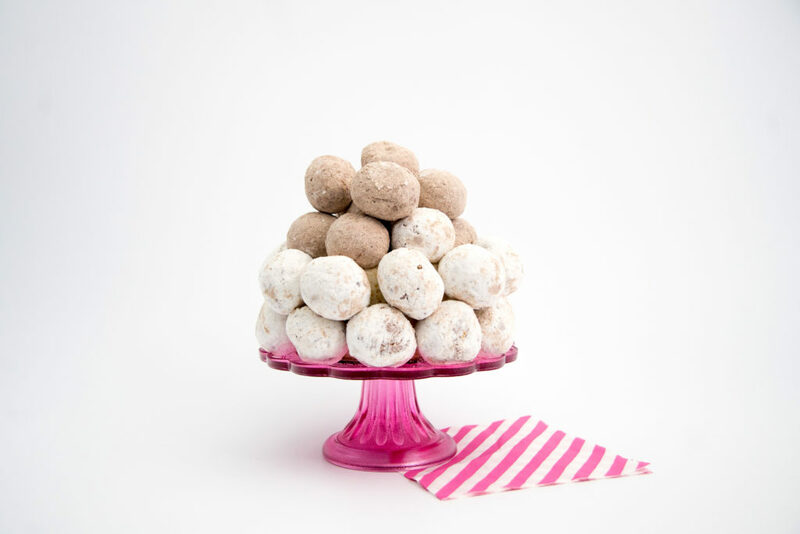 You can stick with neutral colors like I did, or have a ton of fun with sprinkle donut holes, chocolate donut holes, or even mix and match! Regardless, this little beauty involves donuts, so you know it has my stamp of approval! This grocery store cake hack is a super simple way to transform a boring cake into something totally fun and different, without having to bake a thing!